Breakfast at the Hotel. 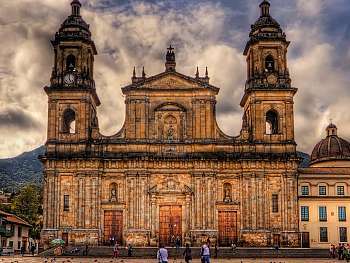 You will start your journey by visiting the historic heart of Bogota. 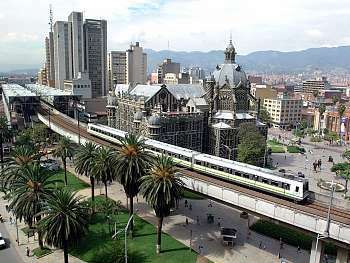 We will walk around Plaza de Bolivar and surrounding areas, where you will be able to see the National Capitol, which is the seat of the Colombian Congress; la Casa de los Comuneros, the Presidential Palace (Casa de Nariño) and the Museum Santa Clara Church. Then you will be able to discover the metalworking processes of more than 34,000 pieces of metalwork displayed at the Gold Museum from various Hispanic cultures. From there, we will visit the House belonged to Simon Bolivar (Quinta de Bolivar) and lastly, the iconic symbol of Bogota, the Monserrate Hill, that rises at 3,152 meters above the sea level. It can be accessed by a funicular. There, you can visit the sanctuary and enjoy the best view of Bogota. Museums are closed on Mondays.Accommodation. Breakfast at the hotel.Today you will be taken for a walk back in time. 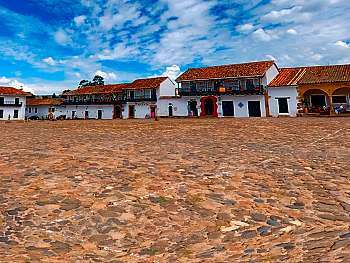 We will visit one of the most romantic and well preserved colonial towns of Colombia, Villa de Leyva. A beautiful town with white houses and streets paved in stones, but not without paying a visit first to the Underground Salt Cathedral, built 180 meters below the surface in Zipaquira. The Salt capital of Colombia. Accommodation. Breakfast at the hotel. 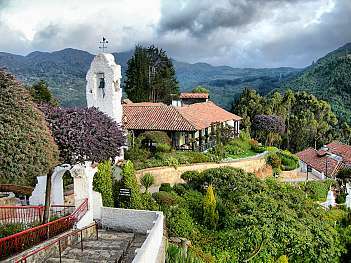 A guided tour around Villa de Leyva will take us across churches, museums, colonial buildings and monasteries to Santo Ecce Homo Convent, one of the most beautiful architectural legacies that have attracted pilgrims since 1620. At the end of this trip we will go back to Bogotá. Accommodation. Breakfast at the hotel.Today you will be taken to the principal location of the National tree and the world’s tallest palm, the Quindio wax palm in the Cocora Valley in the town of Salento. A guide from the area will take us into the natural cloud forest along the eco-trail to enjoy the magnificence of the palm trees and the spectacular landscapes. There, we will have some free time before going to Salento. 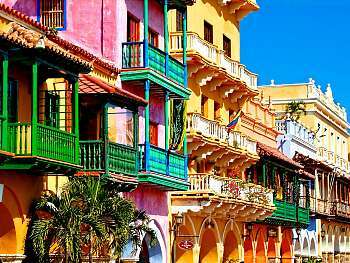 A town of colorful balconies, handicraft workshops and a great viewpoint of the whole area. Well-known also for the delicious trout. Accommodation. Breakfast at the hotel. We will leave in the morning. On our trip to Medellin, we will have the chance to visit a beautiful town in Antioquia, the town of Jardín. Admired for its idyllic and colorful balconies, beautiful coffee farms and breathtaking waterfalls. Arrival in Medellin. Accommodation. Breakfast at the hotel. In our day in Medellin, we will have time to enjoy art and nature. We will visit the first museum established in Antioquia. This Art Museum houses the largest collection of works donated to Medellín by the famous artist Fernando Botero. A collection including sculptures, drawings on canvas, watercolors paintings and photographs. Then, we will visit the Joaquín Antonio Uribe Botanical Garden. This greenbelt area has a collection of 200 species of orchids –around 1600 of them- and more than 1000 living species in general. This venue will be the perfect place for a picnic. At the end of the day, we will take the gondola lift system that provides a complementary public transportation service to the people of Medellin, the Metrocable. One iconic symbol of development of the city. Accommodation. Breakfast at the hotel. Pick-up and transfer to the airport. Morning flight to Santa Marta. On arrival we will go on a road trip to the Natural National Park Tayrona. A Natural park in the Caribbean Sea with beautiful blue waters and 12,000 hectares of green tropical rainforest. Accommodation. Breakfast at the hotel. Day free. You would have the time to enjoy the greatness of this memorable place. Accommodation. Breakfast at the hotel. We will leave the park in the morning to go on a road trip to the city of Cartgena. 4-Hour drive. Accommodation.Breakfast at the hotel. We will leave the park in the morning to go on a road trip to the city of Cartgena. 4-Hour drive. Accommodation. Breakfast at the hotel. Pick-up at the hotel and transfer to the port of Cartagena. We will take a boat to Corales del Rosario National Park and San Bernardo. This natural park on the coast of the Caribbean Sea is the perfect place for a summer, relaxing day. It offers great food, and even greater activities. You can do snorkeling while observing the coral reefs and the many species of fish, crustaceans and sponges among others. 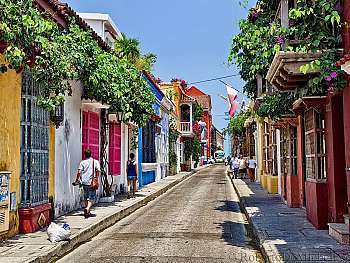 Return to Cartagena. Accommodation. Breakfast in the hotel Pick-up and transfer to the airport as scheduled. 3 Nights Lodging with buffet breakfast. 2 Nights Loging with breakfast. Visit to Hacienda San Alberto for a Coffee Tasting. 3 Nights Lodging with Breakfast.